It is recommended that you brush your teeth twice a day; however, 1 in 4 adults do not do so. It is easy to skip brushing, especially at night because after a long day, you just want to crawl into bed. No matter how tired or busy you may be, it is important to invest in your oral health by brushing twice a day. It is best to use a soft-bristled toothbrush that accommodates the size of your mouth to clean all surfaces of your teeth and your tongue. Use a fluoride toothpaste to brush for two minutes each session to ensure that you are removing food particles and biofilm from your teeth. Even with the best brushing habits, there are still areas in your mouth that your toothbrush cannot reach, which is why it is important to floss every day. Flossing removes harmful bacteria and plaque from in between the teeth and around the gum line that can cause gum disease. With 50% of adults suffering from a form of the infection, it is best to remain proactive about your gum health. Use a dental floss that has earned the American Dental Association’s Seal of Acceptance to clean in between each tooth. Insert the floss between 2 teeth to form a “C” shape. Gently slide the floss down to the gum line and back up to the crown. Even if you do not currently have a dental concern, you need to see your dentist every 6 months for a cleaning and checkup. Your dentist will clean areas that you cannot reach at home, like below the gum line. They will also perform an examination to monitor your dental health to detect areas of concern sooner for quick intervention. In addition to the health of your teeth, their appearance is equally as important. If you are ready to revamp your confidence with an attractive smile, your cosmetic dentist in Lacey offers the effective solutions that you need. 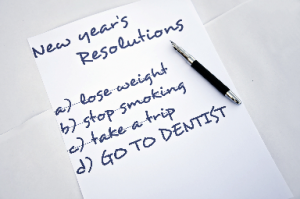 This year, take the time to invest in your oral health with simple dental resolutions. With a renewed commitment to your teeth and gums, you will achieve a healthy, beautiful smile.